Now that most of our Three Cups of Tea glogs are done (a few still need more work by the students to clean them up with proofreading), I decided to create a space where they could all be collected together for viewing by the world (and parents and family). I know a number of people are using wikis for embedding glogs, but I decided to try out Yola.com — which allows you to construct five free websites and it is built on using widgets. I registered at Yola.com (actually, I already have an account there because I have used it for other projects.) I followed the steps there to create a website, chose a theme and was ready to begin building my site in a few minutes. I went over to my “classroom” at the edu-glog site andwent through the glogs that were ready to be brought from the “private” setting to the “public” setting. Only a teacher can do this step. I then found the “embed into page” link below the glog, grabbed the code and went back to my Yola site. There, I inserted an html widget, and copied the embed code. Now, here is where I fiddled a bit. For some reason, the embed code is always too large, so I tinkered with the settings in the html code — I reduced the percentage to 70 and then adjusted the width and length accordingly. You need to do all three for it work right. I wish there were more embed options on the glogster side of the world. Once that is done, you can save and check your work. If it seems OK, then go through the process again. And again. I stacked a handful of glogs per page on the Yola site and divided up my four classes into parts so that there were not too many glogs on one page. If my description doesn’t help, you can also view this video tutorial someone made about embedding a glog into a Google Site website, which is pretty close to using Yola. But please take a few minutes to check out the glogs of my students — I am pretty impressed with what they were able to accomplish. This is the last of the puppet shows that were filmed. It was delayed because of illness and other reasons. There are just two girls behind the theater and many characters, so they struggled a bit with the presentation. You can view all of the puppet shows over at our website. 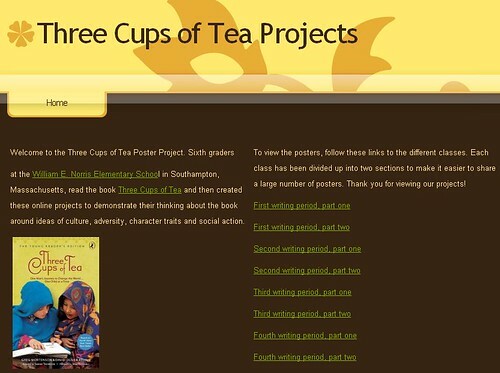 I am working on building a Yola website for all of my students’ Three Cups of Tea online posters, via Glogster. Some are just so well-done and interesting that I feel that I might be sharing here now and then. I gave them some final time yesterday to complete their work and all of the projects are now graded and most are ready for publishing. One thing I did like about the closed glog network is that I could message the students directly, note any spelling errors or content omissions or general comments, and then they could work right from the site to edit their projects. Here is an examplar project, in my mind. The design works for the project, their audio was a nice touch, the video complemented their work and they were thoughtful in their answers. 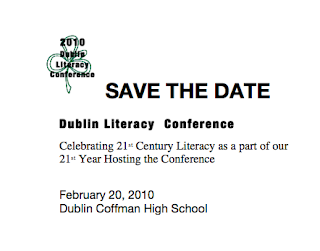 In a few weeks, I am off to Dublin, Ohio, for an exciting weekend event — the Dublin Literacy Conference. I have been asked by the wonderful folks over at A Year of Reading (Franki and Mary Lee) to come as a presenter, which is a great honor. And the event looks fantastic, too. Presenters and speakers at the conference include Tim Tyson, Katie Van Sluys, and Ann Marie Corgill. Children’s authors in attendance will include Melissa Sweet, Patrick Carman, David J. Smith and Denise Fleming. I’ll be doing sessions around digital picture books and using webcomics in the classroom. But I am most interested in a family session that runs at the conference for parents and their children. I offered to show how to create stopmotion movies. Imagine my surprise (good surprise) when Franki mentions to me that about 150 people have signed up for that session, with about 2/3 of them being kids. Wow. Now, I need to think of ways that not only can I get info out to the crowd, but also get the crowd working on something that we can quickly make into a movie. I am leaning towards handing out Wiki Stix, having people make characters and then create a parade of strange people (the wikistix folks, not the participants) as a movie. This will be an interesting experience, for sure. I am knee-deep in planning a pretty large concert in two weeks that was spurred on first by a request from a student to conduct some community service and then by our reading of the Three Cups of Tea book. First, a student of mine came to me to say that his church was talking about the great need — the continued great need — of schools in New Orleans for books, as many have not recovered from Hurricane Katrina. I told him that in the past, we did do a big benefit concert for Katrina and we raised a lot of money for disaster relief. We both thought: maybe another concert? Then, we read Three Cups of Tea, and the fifth grade at our school read it, too, and our school became involved in collecting coins for Pennies for Peace. It is a tangible way for our students to engage the book beyond the page and make a difference. 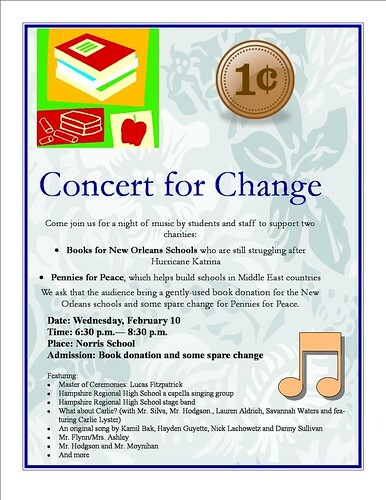 So, as we talked about Pennies for Peace and the book, the concert idea popped up again. What if we pulled together student and staff musicians and asked folks to donate a gently-used book and some coins, and then, put on a night of music? Our Concert for Change comes up in less than two weeks and I love the mix of performers — from staff colleagues, to current students (one of my students even wrote an original song for the event), to past students coming back to get involved. I am even trying to get a large group of fifth and sixth graders on stage for the grand finale, singing the song “Three Cups of Tea,” which our music teacher has spent time teaching them all. It’s a gamble, but I think it will work, and I figure, even if it doesn’t come off completely in tune, it will be a great way to end the night. I love how music can really galvanize a community. 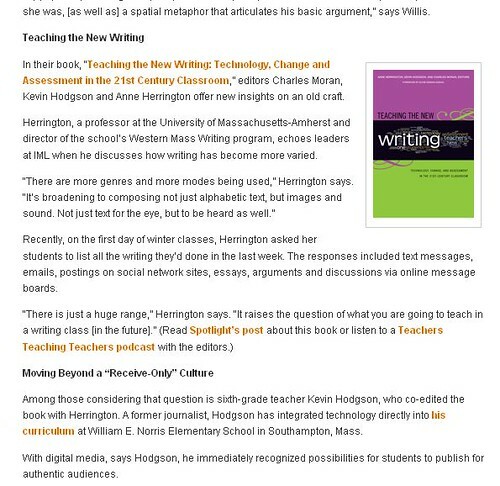 Our book — Teaching the New Writing: Technology, Change and Assessment in the 21st century Classroom — got a nice mention in a recent article through the MacArthur Foundation’s online magazine — Spotlight on Digital Media and Learning. The article looks at how multimedia composition can impact student learning. The Kids are Ready! The Teachers? A number of us gathered yesterday afternoon at our school district office to discuss the role of technology in our vision for our students. I’d call it a first step but I am not sure anything really got done in the 90 minutes. We talked a lot. We threw some ideas out. We’re going to meet again in five weeks. But I don’t think we really know where we are going with it. We need to make sure that the concept of student learning is at the center of any vision plan. As we went around the room and each school talked about the elements of their five year technology plan, I heard a lot about “hardware” and “administration” and other ideas that are important (for sure) but we need to shift our language to more student-centered ideas. After a discussion about what students are doing outside of school as compared to what we are doing inside the school (ie, a disconnect between the literacy and media they use in their lives and the literacy we teach them), I mentioned that, when it comes to using new technology, “The students are ready. The teachers are not.” I am referring to the fact that so many teachers have not yet made the leap into using technology beyond gathering information from websites. We need to help our colleagues. Thus, the concept of a technology coach, who could work directly in the classroom with a teacher to weave technology into the curriculum, and not have technology as some stand-alone cool concept. But teachers need a helping hand. If we want to really transform teaching practice, this coach concept would make a huge difference. Access for all students — whatever their socioeconomic level — is critical and we can’t rely on our students learning these New Literacies outside of our door. The kids with families of means will be fine, but the ones without means — those ones we really need to reach, in fact — will fall further behind. This means that technology-infused work has to be done in school and we need the tools and the know-how to make that happen. And finally, technology need not be some new initiative on its own — technology should be woven into the curriculum work we are already doing (such as our two-year Literacy Initiative). If we do this, then teachers will see our district values this push and that it is just part of what we do. It isn’t right now. I’m sure my friend and colleague, Gail, will add her own thoughts. She was there and I was glad — too often, the early elementary grades get completely left out of the conversations around technology. She made sure the kindergarten set had a voice. I often have to bite my tongue at these gatherings, for fear of taking over the discussions. I am pretty passionate about it and have strong ideas. And when it is a room of principals (nice people, all, and open to ideas), I need to be careful of what I say. I don’t want to inadvertently step on toes or give the wrong impression about what our schools are doing. We’ve made a lot of progress in the last five years — light years of progress, actually — but I find myself impatient. Emerging technology continues to play a vital role in the modern industrial society in which computers and software are integral to success in the life of our citizens. The William E. Norris Elementary School Technology Team views its role as important in integrating technology into the classrooms in ways that will help prepare students to succeed in this rapidly changing world. The primary goal of all technology initiatives within this plan will be the positive impact such endeavors will have student learning. Yesterday, we began our unit on the origins of words, with me using my Prezi show to engage the students in discussions about where they think our language comes from. Most had never even thought about it, so they were pretty focused on our discussions. They all laughed at the high school that has banned the word “Meep” because of overuse (or disruptive use) by students. I finished the overview up with a talk about the dictionary. I asked: how many of you have used a book dictionary to look something up in the past two months. Out of about 75 kids (in four classes), about a dozen raised their hands. Then, I asked: how many of you have used an Internet-based dictionary in the past two months to look something up? I got about 95 percent of the kids with hands in the air, although one student reminded us that “you can’t always trust what you find on the Internet.” We had a discussion about the pros and cons of online versus paper dictionaries. I acknowledged that most of us now turn to the Net for ways to gather information but that a dictionary is still an important source and we then spent some time going over how you “read” a dictionary — skills they clearly were lacking. We talked about guide words, pronunciation, syllables, parts of speech and even the origins of words. The activity they had was to spend a few minutes looking through the dictionary and find a word they did not know, figure out the pronunciation and read the word and definition to the class. You would not imagine how much fun they had with this simple activity. They were laughing, looking and sharing left and right. It was a blast. As an interesting side note: at the end of the year, when our sixth graders move on to our regional middle/high school, they are presented with a gift from the local Mothers’ Club: a beautiful dictionary. We’ve been trying to decide if this is still a useful gift, given the times, and after yesterday, I still think it is. They need to know and understand the dictionary, even if their use of online resources grows. Our Western Massachusetts Writing Project is in the midst of planning our third Spring Technology Conference and each year, we try to find a theme. One year, it was Tech Across the Curriculum. The next, it was Digital Storytelling. This year, we are trying to provide time to explore some of the free platforms that are available for teachers and students. We are calling it Unlock the Power of No-Cost Tech Tools for Teachers. For us at WMWP, this easily falls under one of our main missions of providing access to resources to as many students and teachers as possible. Our hope is that teachers will play and explore, and then reflect on the possibilities for the classroom. 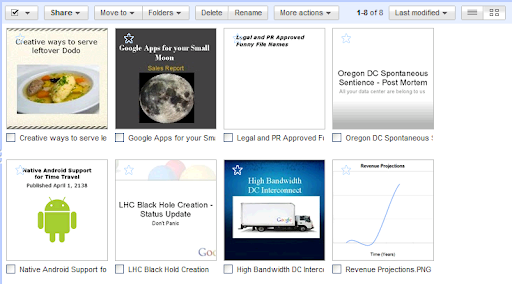 Here are the tools we intend to showcase during the conference, which takes place in late March. and a few more things here and there. If you live or work in Western Massachusetts and are interested in more information, leave me a note here and I will contact you. Or you can keep an eye out at our WMWP website for an upcoming announcement.